OsteoScreen identified OSH 101 as a candidate drug for hair re-growth in a proprietary screening program. In animal studies, it was observed that topical administration of OSH101 strongly stimulates dormant hair follicles, increases hair follicle thickness, and overall hair growth. 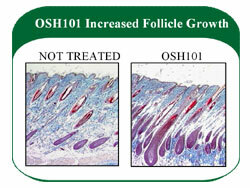 The picture to the right demonstrates the increase in the size and thickness of hair follicles treated topically with OSH101 versus untreated controls. The purple colored bulbs are hair follicles. In the untreated control, the follicles remain small and inactive, while the follicles in the treated group were stimulated and show marked increase in their size and thickness. Treatment with OSH101 for 21 days re-grew healthy, thick hair; whereas the untreated control group barely began to re-grow any hair. OSH101 is a powerful stimulator of new hair growth. OSH101’s hair growth effect was also compared to the hair growth effect of Rogaine®. The two groups were treated with OSH101 and Rogaine® respectively once per day for five days. After an additional sixteen days elapsed, hair growth was measured. OSH101 resulted in much faster and thicker hair growth than Rogaine®. Another area of need is chemotherapy-induced hair loss. Many cancer patients who have undergone chemotherapy suffer from acute alopecia. It takes time for the hair to grow back, even after the chemotherapy has ended. The efficacy of OSH101 was determined in a model of chemotherapy-induced baldness. This model is well-described in the medical literature. OSH101 was applied to groups previously treated with cyclophosphamide (a widely-used chemotherapy) to induce hair loss. OSH101 stimulated extremely rapid hair re-growth compared to vehicle alone. Intellectual Property: OsteoScreen holds patents for the use of OSH101 for stimulating hair growth. OSH101 significantly enhanced hair growth in laboratory models by stimulating dormant hair follicles. OSH101 produced superior results to Rogaine® in the same models. OSH101 enhanced hair re-growth in a chemotherapy-induced alopecia model. Non-GLP pre-clinical toxicity studies showed OSH101 is safe. Phase I clinical trials complete. Alopecia areata (autoimmune skin disease resulting in hair loss).